She-Bang Rave Unit are DJs from Edinburgh who know how to throw a party. 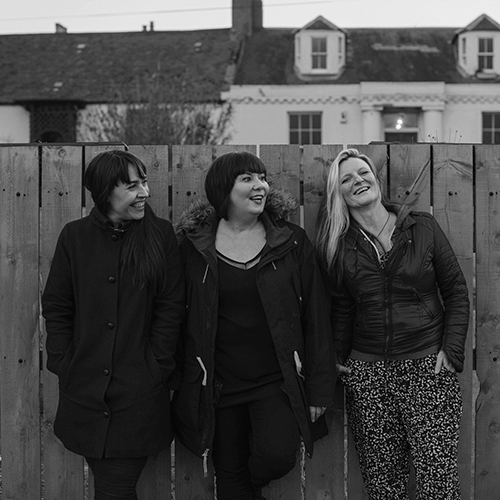 The ‘Unit’- Abi Cornwall, Kirstie Paton and Vicki Watson – bonded at the legendary club night Pure over a love of Detroit techno, house and electro. In 2010 the girls formed She-Bang Rave Unit, since then they have been causing damage on the dance floor to an ever expanding crowd. Abi is a Writer and DJ. She has wildly eclectic taste in music and likes to play sets which reflect that. You will hear: Talking Heads to Green Velvet and everything in between. You won’t hear: Mr. Blue Sky. Kirstie is a Graphic Designer and DJ. She started organising parties in the mid nighties and later began playing at the events. You will hear: Mike Dunn to Prince in her dance floor sets. You won’t hear: Anything with a Saxophone breakdown …….. unless it’s by Neneh Cherry. Vicki is a Photographer, Fundraiser and DJ, originally fundraising clubs nights around Edinburgh before taking up her place as the DJ. You will hear: Paranoid London to The Fall with a Factory Floor chaser. You won’t hear: Anything with a ‘take it to the bridge’ chorus. As well as being seasoned clubbers with a record collection that spans decades, they’ve played a number of high profile clubs and parties across Scotland. They’re residents at a regular night in Edinburgh’s Bongo Club, as well as seeing off many a DJ to claim the prized spot of THE DJs at Leith Gala Day. They’ve played a support slot for Jon Pleased Wimmin at FiniTribe’s invitation and as the Guest DJs at Neu! Reekie’s 2015 Big Christmas Bash. 2016 has been a brilliant year for them, having played as the guests of Glasgow’s Frogbeats Collective, as FiniTribe’s ‘introducing’ guests at Paradise Palms and at the Leith Late Opening Party before kicking off the festival circuit with slots at Audio Soup and Belladrum Tartan Heart. The Guardian touted the group as one of their ‘Top 5 Acts to See at New Year’ and their quirky, upbeat sets of party techno, house, electro, old classics and rare gems fill the floor every time.